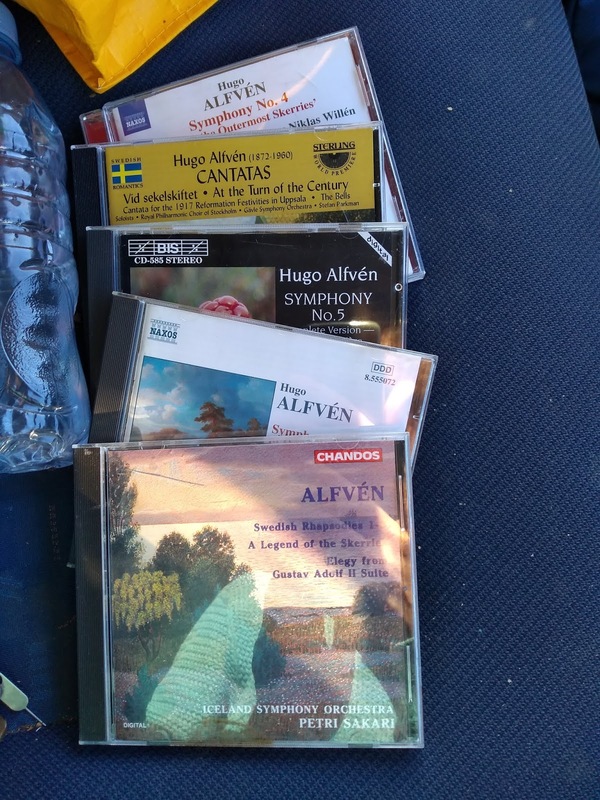 Mainly due to people asking me what I want for my birthday, I've managed to build up quite a stock of music by the Swedish composer Hugo Alfvén (1872 - 1960). I'm not much good at writing about classical music, but this post gives me a chance to arrange the various pieces on these CDs into chronological order. They are all either orchestral or for chorus and orchestra. At the time this was the most ambitious Swedish symphony. 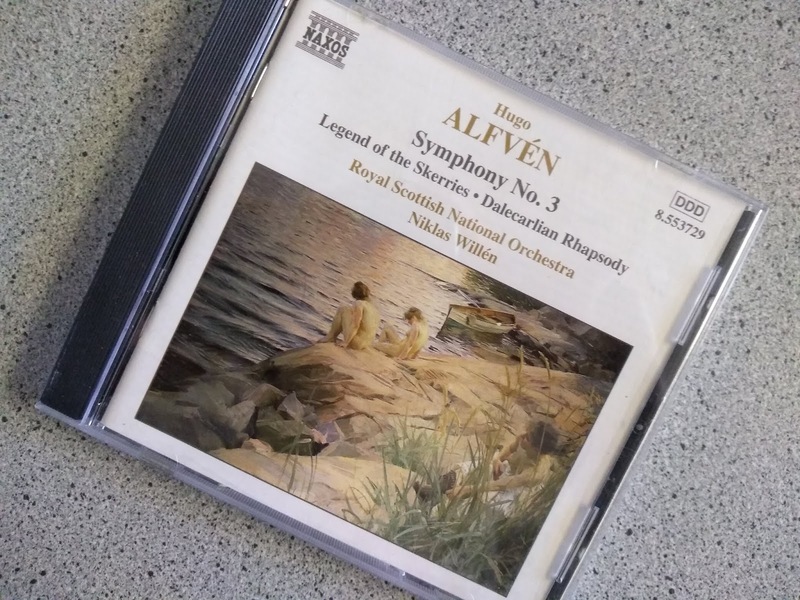 At this date Alfvén was not so far behind the musical developments of other European traditions: it's late romantic, chromatic, and Alfvén brought a new virtuosity of orchestral handling into Swedish music (comparisons with Strauss don't really do him much service, though). There's a slight lack of balance: the first, third and fourth movements hang together as a fine medium-to-bold symphony, but the long second movement aims at being positively heroic, or should I say Eroic? Cantata for soprano, choir and orchestra, with text by Erik Axel Karlfeldt. Very enjoyable! Doubtless the best-known piece of Swedish classical music outside Sweden, this is an irresistible popular piece, book-ended by folk-dances with a serene Nordic night between. Stormy tone-poem depicting autumn night on the skerries. (To some extent intended as a contrast to the preceding piece.) Probably my single favourite piece by Alfvén: everything develops so naturally and inventively from the opening calm. The composer has such a stock of good ideas in these early years, and his orchestral skills make for very satisfying elegant pieces... Scandinavian-design sofas and shelving units. Alfvén was very fond of messing about in the Stockholm archipelago (the skerries). The locale also inspired his Symphony No. 4. A charming and cheerful piece based on students' songs, evidently recalling Brahms' Academic Festival Overture, but much less elaborately composed. The luminous colours make some atonement for that. The text for the final section (Luthers hammare) is by Karlfeldt. Its late arrival meant that Alfvén wrote a stark and dramatic arrangement, in effective contrast to the more elaborate choral writing of the first two sections. To some this is his greatest work, along with the ballet Bergakungen (see next). His first three symphonies had been easy to enjoy as symphonies. In this case the four movements flow together and all share the same melodic material. It's a symphony that's trying to be a large-scale tone poem, including sections with two wordless voices and a sort of skeletal narrative. "My symphony tells the tale of two young souls. The action takes place in the skerries, where sea sea rages among the rocks on gloomy, stormy nights, by moonlight and in sunshine . . . the moods of nature are no less than symbols for the human heart." I find these two quite different forms difficult to meld in my head while I'm listening. Harmonically it's his most "advanced" work, reminding me of Scriabin sometimes. Alfvén worked on the ballet pantomime Bergakungen (Op. 37) from 1916 to 1923. This concert suite has just four pieces; the breakneck Vallflickans dans (Herdmaiden's Dance) is one of his most popular pieces, often performed separately. The last of the three rhapsodies, a comparatively melancholy piece, based on Dala folk melodies from the area north of Lake Siljan. Alfvén outlined a program (a shepherdess's memories and thoughts, returning with a crash to present melancholy). The composer, though born in Stockholm, made his home in Dalarna for much of his life. Written for the play "Vi" by Ludvig Nordström, later part of a suite called "Gustav Adolf II", but this Adagio is often performed on its own. The motif of two falling chromatic seconds also occurs in the 4th Symphony (the young man's theme). A triumphal piece for a popular audience. The ballet was based on folk pictures of the biblical parable. Alfvén at 85 was unable to compose a complete ballet from scratch (I don't think it was given an Opus number). He re-used some pieces of earlier music as well as adding new material based on folk melodies, which is what we get in the very attractive concert suite. The polka and final polska are a delight. There's some inconsistency about the names of the seven sections. These are the most complete ones I can find.